Apologies, dear Readers, for the delay in posting on the Animated Eye. 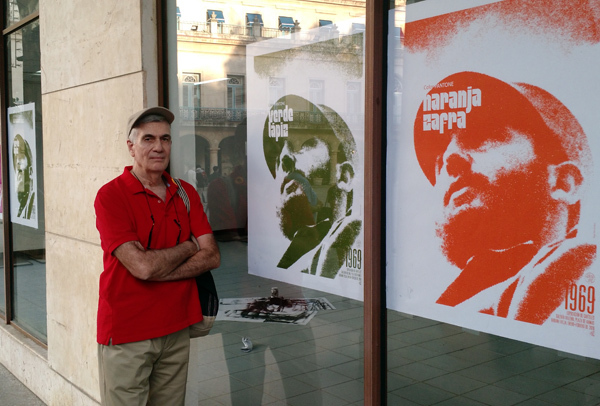 It was a busy holiday season, part of it spent traveling, a highlight of which was an all-too-brief visit to Havana, documented below in text and photos by me and Joe Kennedy. 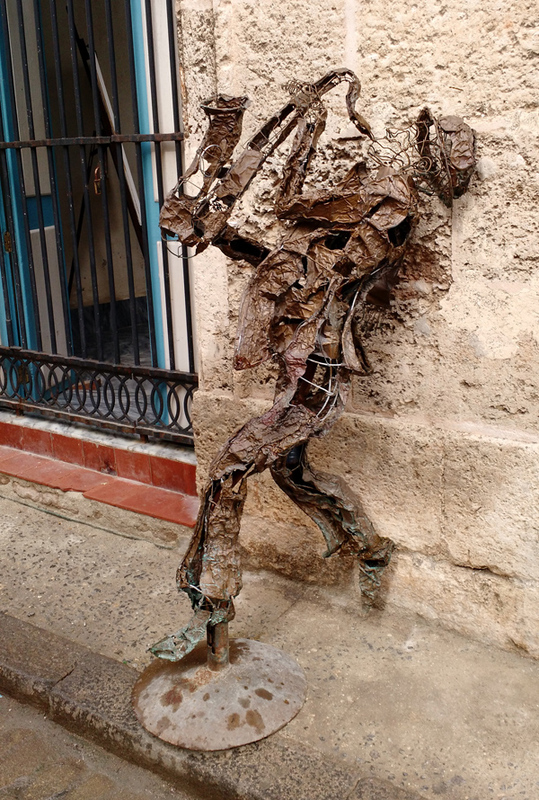 A copper collage of a distorted saxophonist stands on a corner at the Plaza de la Catedral in Old Havana. The fragmented, silent musician holds a strong pose, strenuously reaching for unheard, deeply felt music. Strikingly ravaged, he reminds me of Ryan Larkins’ CGI shards in Ryan, the 2004 Oscar-winning short. 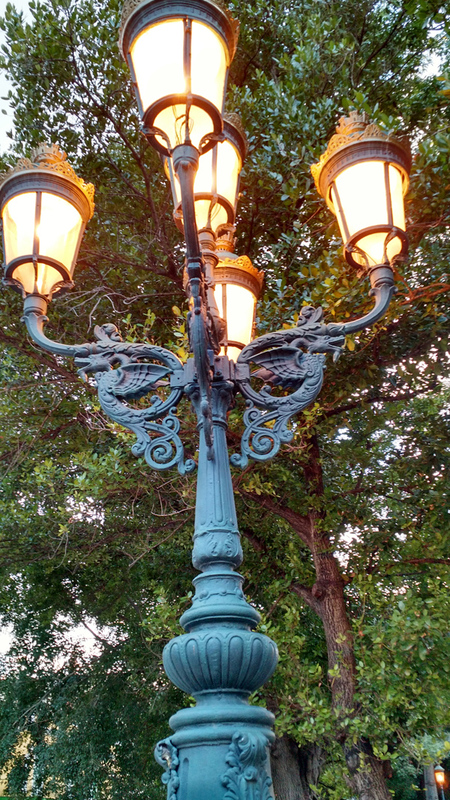 Weathering and oxidation lend a green patina to parts of the Cuban copper sculpture, same as the colored patina on America’s Statue of Liberty. I’d like to think the unknown Cuban artist meant this as a subtle political comment. To me, this passionate, mute street musician represents the Cuban people’s struggles to survive through the years, and their durable adaptability despite severe changes in living conditions and politics. 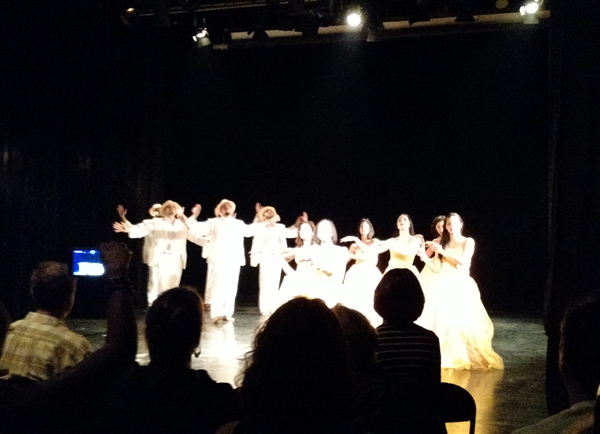 It also symbolizes their innate musicality — for music is heard in all corners of the large island of Cuba — and their high quality artistic imaginations and accomplishments. 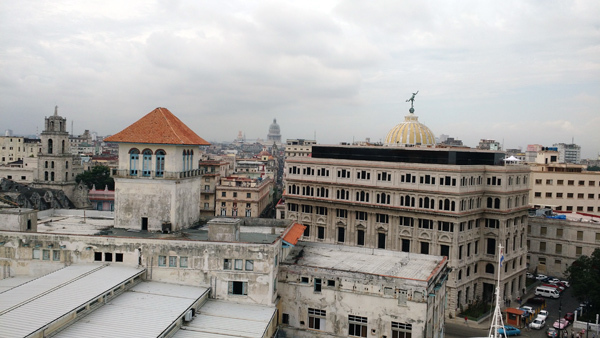 President Barack Obama restored diplomatic ties with Havana in 2015, including increased commercial relations and expanded travel to Cuba. In November 2017, the Trump administration and a lickspittle GOP congress — in keeping with its white supremacist, racist bias against people of color (Muslims, Haitians, Africans, African Americans, Mexicans, among others, including LGBTQ people of all colors), and its delight in cruelly tearing families apart and using children as pawns (DACA, CHIP) in a nod to its hard-line political base — reversed the Obama administration’s normalization with the communist-ruled island. 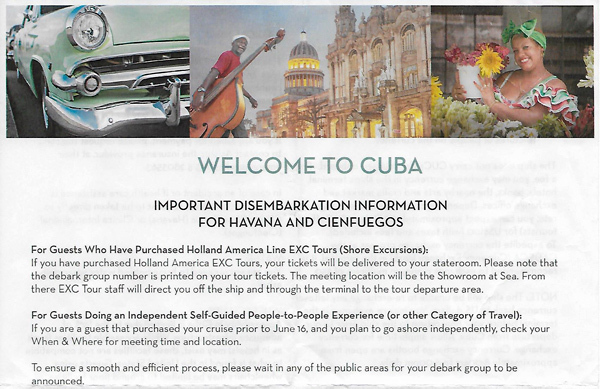 “Persons subject to U.S. jurisdiction” who wish to travel or do business with Cuba now face tighter restrictions. Travel is allowable under specified categories; for example in licensed groups on cruise ships. 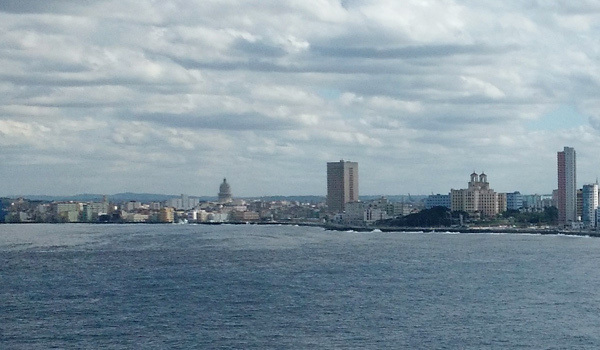 So, in early January, Joe Kennedy and I boarded the MS Veendam in Fort Lauderdale for a Caribbean tour because it concluded by docking overnight in Cuba’s capital city, Old Havana (La Habana Vieja). Following are some images and thoughts from our visit. 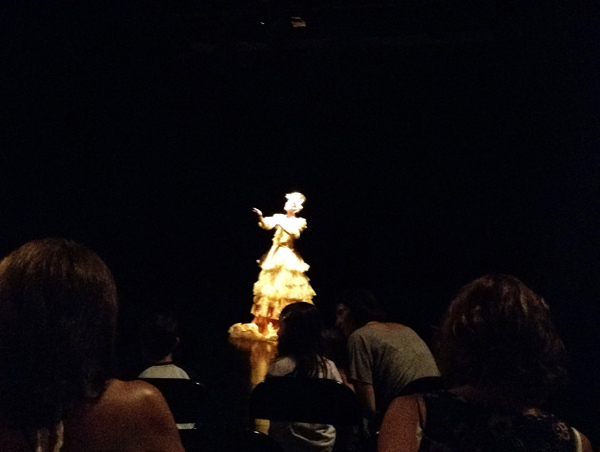 Though brief, it allowed a tantalizing glimpse of the island’s cultural heritage in art exhibitions, architecture, music, and dance, and it left us hungry to return for more. 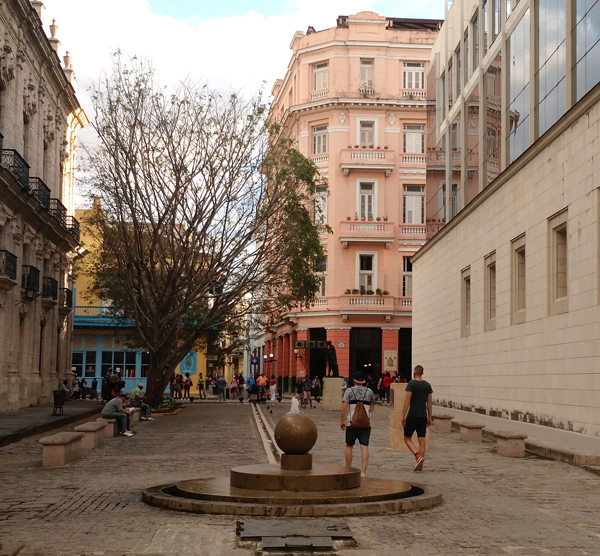 Old Havana’s four main plazas have been restored, and one is located on the harbor, directly across from the pier. The wide Plaza de San Francisco de Assis features baroques structures, including the old customs house and the Basilica, built in the late 1500s, with its high bell tower dominating the space with imposing grandeur. 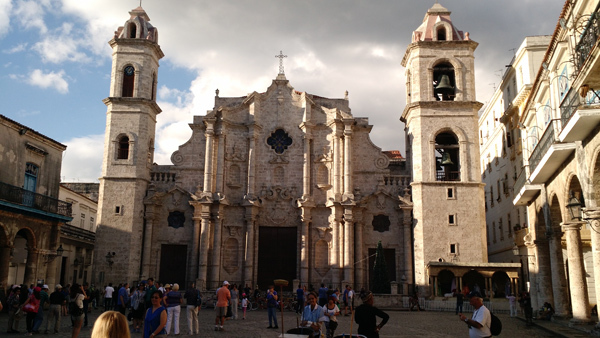 The Plaza de la Catedral’s eponymous structure, above, with its two asymmetrical bell towers completed in 1778, is one of eleven Roman Catholic cathedrals in Cuba. 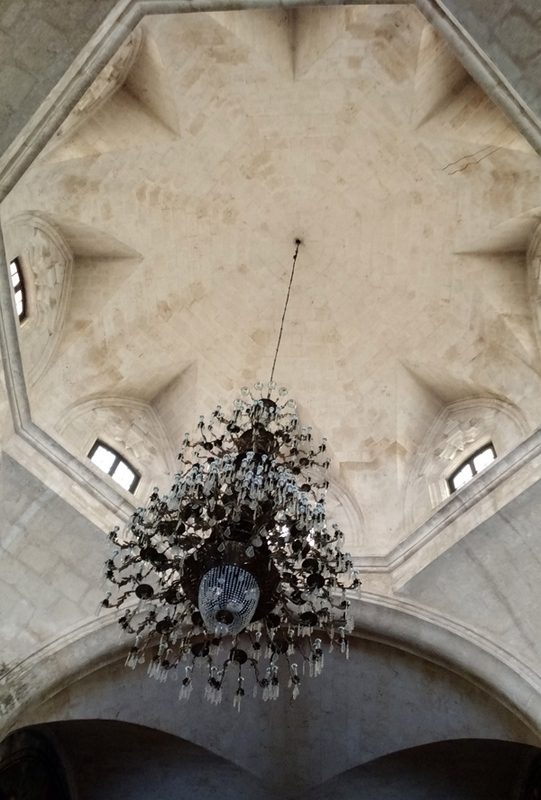 Designed by Italian architect Francesco Borromini, the building has been described as “music set in stone.” Inside, the cathedral is filled with artworks painted and sculpted, and a huge, stunningly beautiful chandelier. 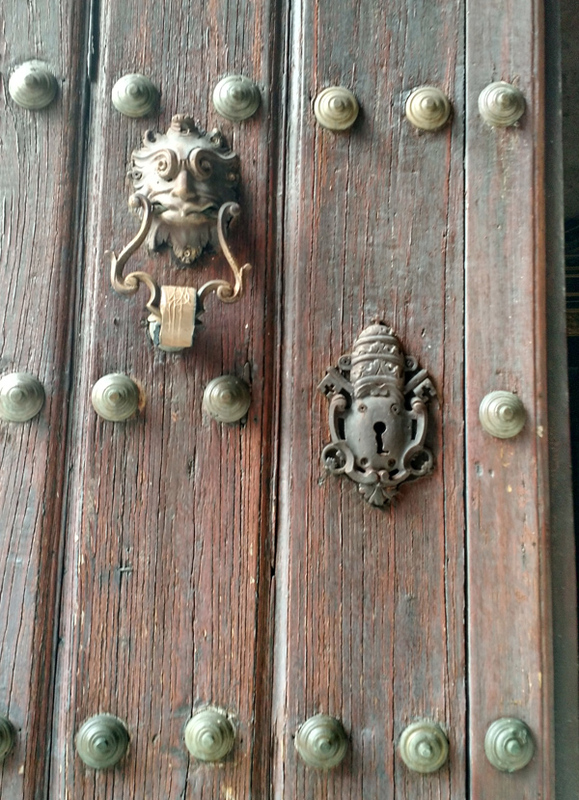 There is whimsy, too: on giant, wooden front doors two delightful anthropomorphic objects — a door knocker and a keyhole – are straight out of Tenniel’s (and Disney’s) Wonderland. The majestic space once contained the human remains of Christopher Columbus until they were removed in 1898 to Seville Cathedral in Spain. Goodbye, Columbus. 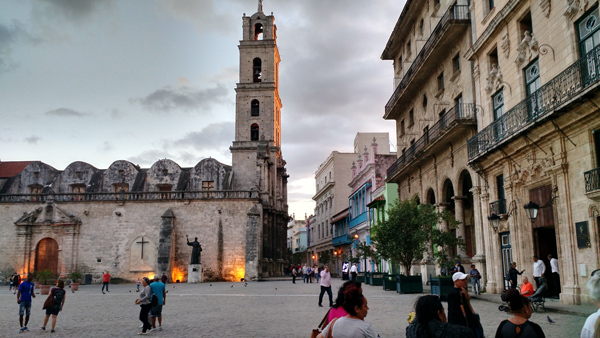 Nearby streets offer museums and gift shops, experimental graphic arts workshops, bookstores, cigar and liquor stores, and restaurants with live bands. 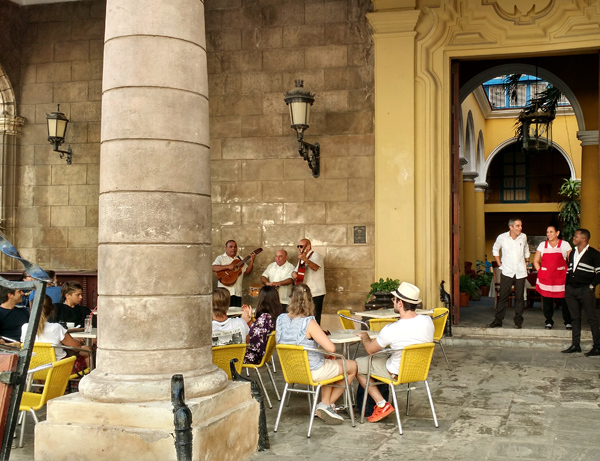 The spirit of Ernest Hemingway is alive and well in Old Havana; bars and hotels the famed writer frequented in the 1930s remain popular tourist attractions. 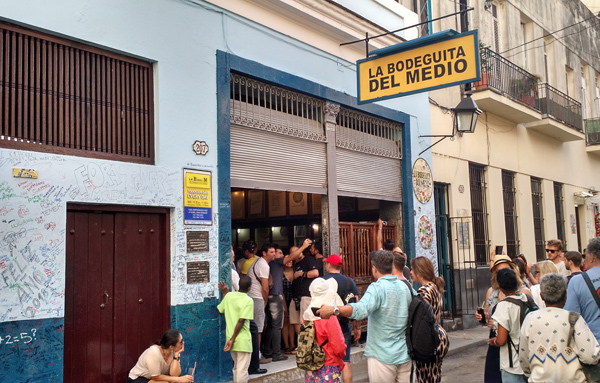 Including the renovated pink Ambos Mundos, above, where, in Room 511, he wrote For Whom the Bell Tolls, and one of his favorite watering holes, La Bodeguita del Medio. 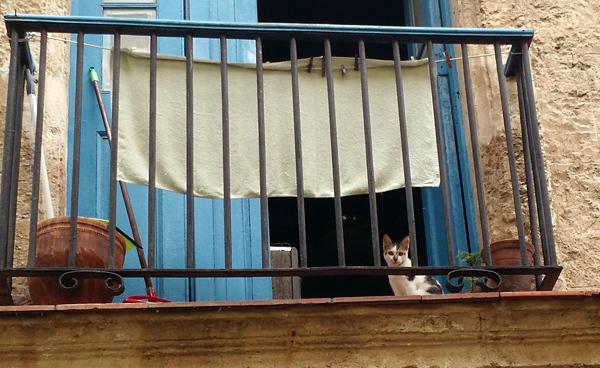 “Cuba has three icons,” said Hemingway’s granddaughter Mariel, “Che, Fidel and my grandfather.” In addition to loving women, cigars, mojitos and daiquiris, Hemingway held a fondness for abandoned cats. 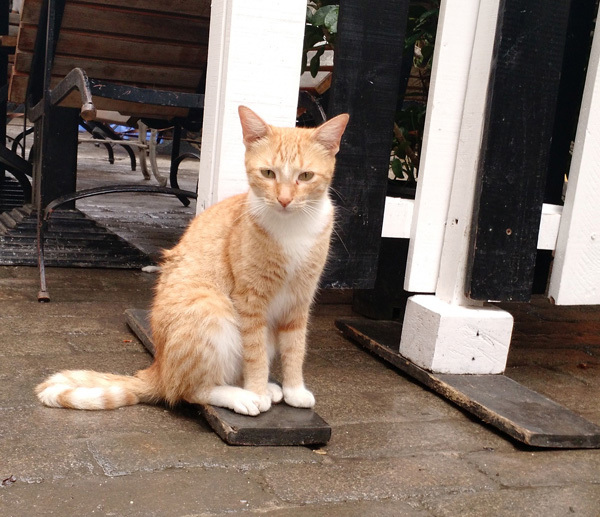 He and his wife, Mary, shared a large property with about 50 cats, many of them of the polydactyl variety, at Finca Vigia, his home ten miles outside Havana . 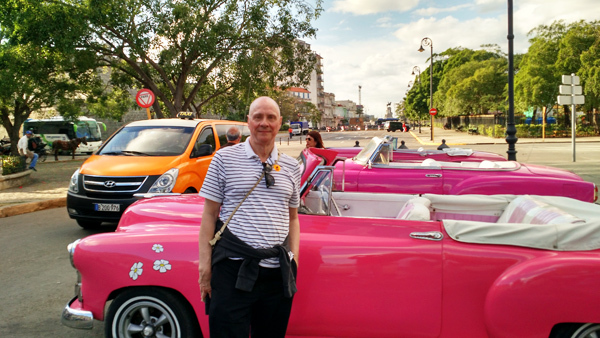 Stunning classic cars from the 1950s (“coches Americanos” or “máquinas”) are everywhere in Old Havana, the same ones Cubans were driving before the 1959 revolution. The fantastic exteriors are authentic, but maintaining the cars’ motors and finding various mechanical parts to keep the fantasies going requires great ingenuity from the owners. At times, the streets resemble a Hollywood studio backlot for Guys and Dolls or Grease. This “mouth of truth” was once a letterbox in Havana’s main post office, built in the 1700s, now restored as an art gallery. 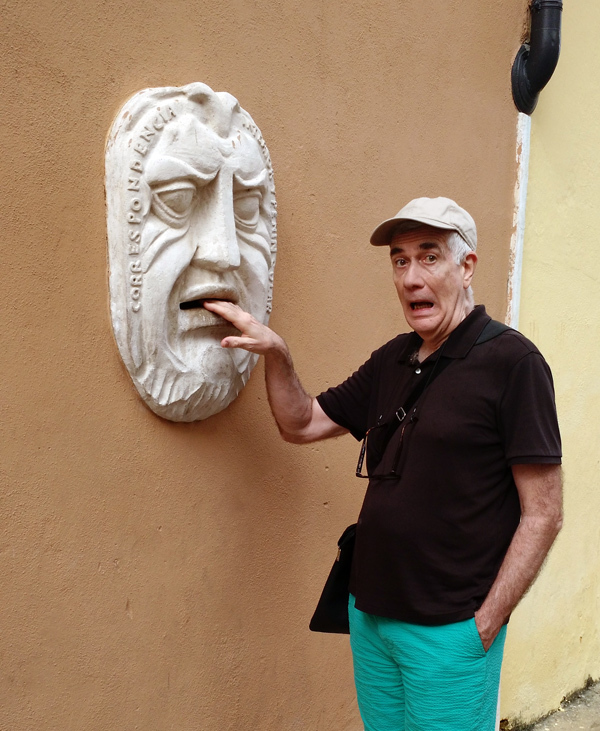 Gregory Peck in Roman Holiday (1953) did the Bocca della Verita bit much better than I. 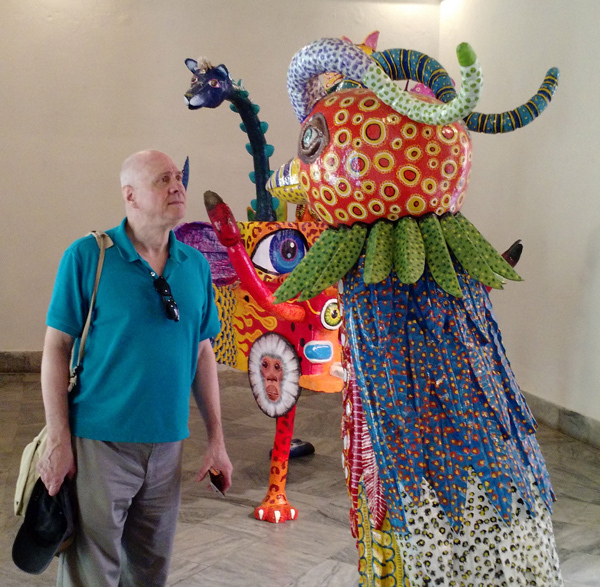 Since opening in 1988, the beautifully designed Museo Casa de Mexico Benito Juarez is an important center promoting Mexican culture, and its links with Cuba. 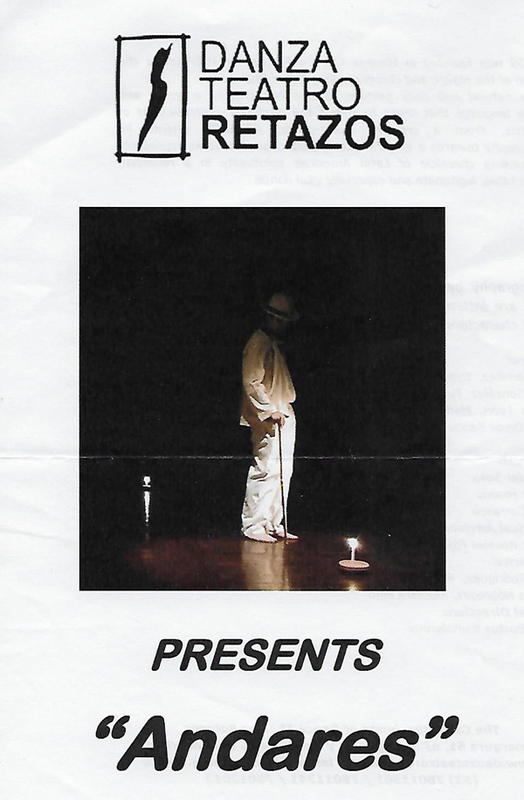 On display are modern and popular artworks alongside ceramic pieces from Mexico from the 17th and 18th centuries found in archeological excavations in Old Havana. 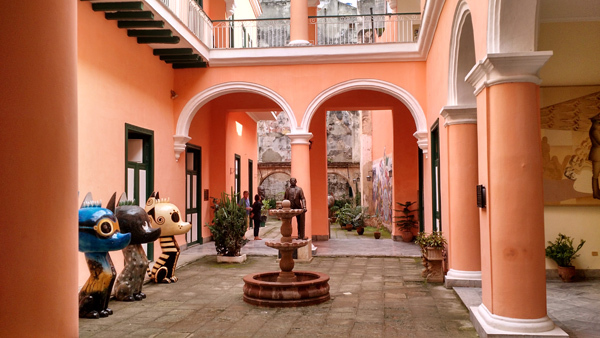 The art is housed in courtyards and multi-colored, spacious rooms in an 18th century refurbished building in Obrapia Street. In the current exhibition, large-scale sculpted phantasmagorical creatures stand tall to stare at you with multiple eyes, tongues and heads. 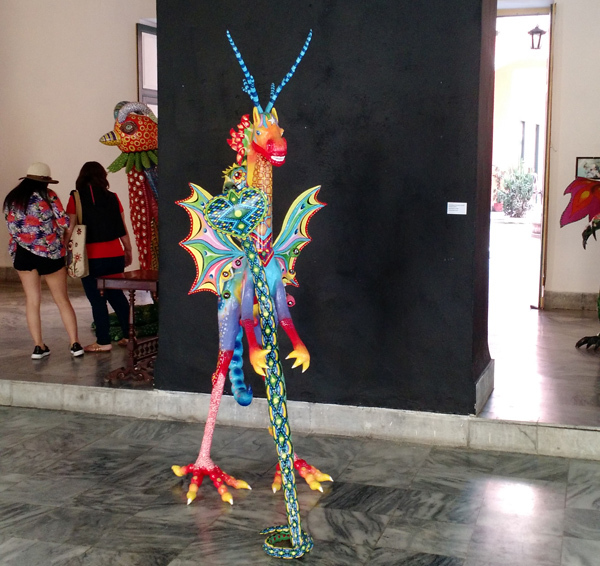 Inspired by Mexican mythology and folklore, the designs are scary/zany, the colors dazzling. At the far end of the gallery, one passes under arches to enter a courtyard of unpainted, crumbling walls and remnants of a ceiling. The area is not under repair, nor sectioned off from visitors. It is, I believe, purposefully symbolic, representing in contrasting texture and form, the realities and difficulties of life today in Cuba, politically and financially. Museo Casa Mexico is but a few blocks from streets filled with tightly packed, over-crowded, decaying buildings, and the day-to-day hard realities of life. Last fall, category 5 Hurricane Irma smashed and flooded homes and businesses throughout the island; then Trump’s “hurricane” of new travel restrictions battered hopes of the Cuban people that they no longer would be pawns in a U.S. domestic political debate. 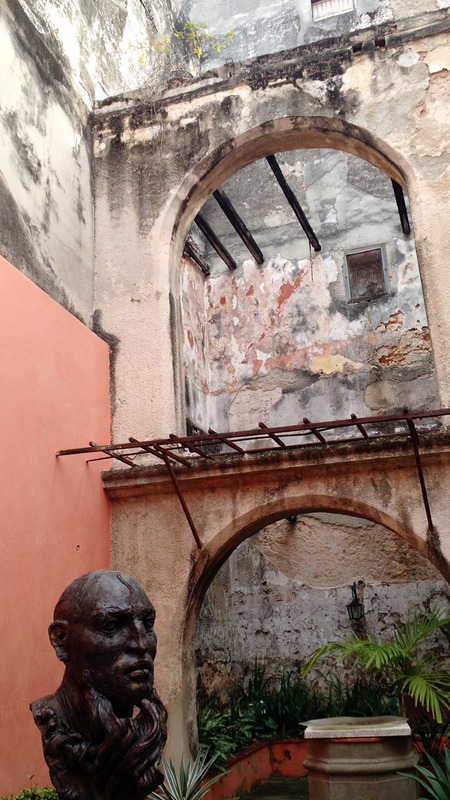 The corroding room at the Museo Casa Mexico may, in fact, be an artistic beacon, a light of determined hope that a future of positive change for Cuba and its people may be possible, sooner or later. In the meantime, visit this amazing country and see for yourself. 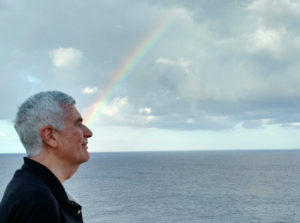 Stunning photos (and stories), John! 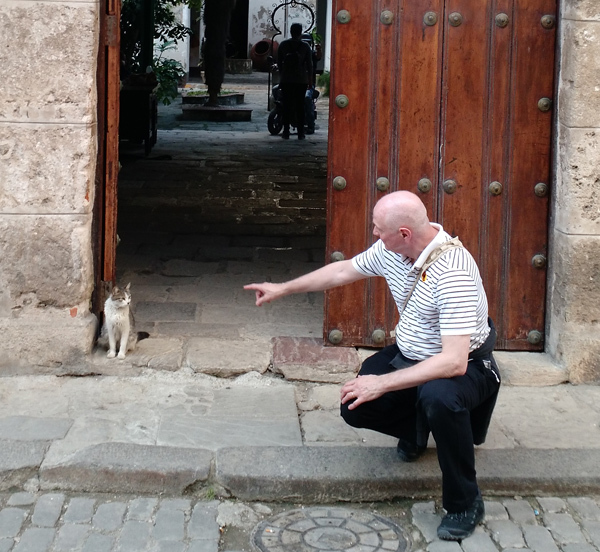 I so enjoyed your blog about Cuba! 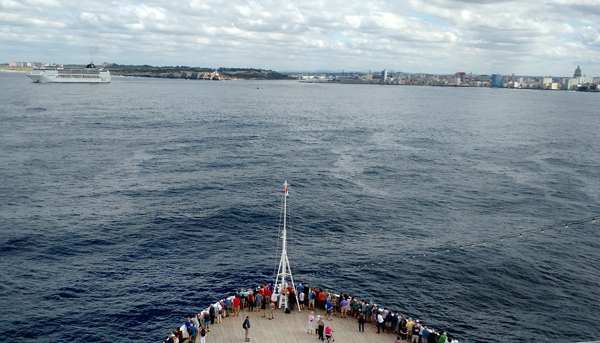 You explored so beautifully the places to experience in Havana! I have moved to Taos- come by and visit sometime! John, Looks like an amazing trip !